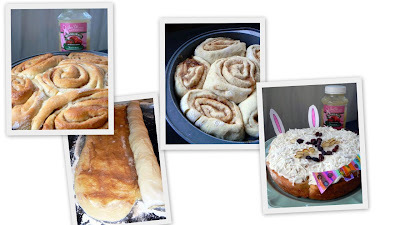 So Easter is here and I wanted to share with you a couple of recipes I made that would be fun to have during the weekend and anytime. We were sent one jar of Musselman’s Regular Apple Sauce and one jar of Musselman’s Natural Apple Sauce for review during this Easter Spring time. We were also sent supplies for our kids to create bunny theme table settings, but I chose to do things a little different. Below I made up some special applesauce cinnamon rolls and converted them into a cute bunny face with ears and bowties! 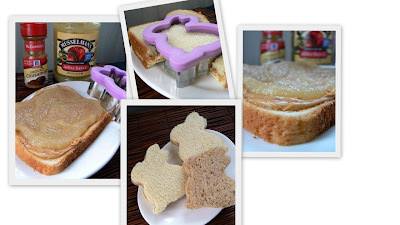 We also made some peanut butter sandwiches with a twist! No jam! Instead we used applesauce, and cut them into cute bunny shapes with our new shaped cutter they sent us! Grab yourself some Musselman's Apple Sauce coupons here and head to the nearest store! Join them on Facebook too! I decided to try and find a recipe using applesauce in cinnamon rolls, as a filling, sure enough I found something and adapted it a little to use in my tried and true go-to cinnamon roll recipe. If you'd like to try another apple cinnamon roll recipe I made, check this out! That one has an apple mixture baked in. These applesauce rolls were wonderful! I was worried with the pudding and applesauce they'd be to soft and runny, but no! They baked wonderfully and were moist and delicious. The applesauce ended up baking into the dough, and I thought it'd be more of a layer of filling. We loved them! Preheat oven on warm temp for rising, about 170'. Grease 4 -8" round pans. In a small bowl combine water, yeast and sugar. Stir until dissolved. Set aside. In large bowl, take pudding mix and prepare according to package directions. Add butter, eggs and salt. Mix well. Then add yeast mixture. Blend. Gradually add flour; knead until smooth. Do not over flour the dough! It should be very soft but not sticky. Place in a greased bowl. Cover and let rise until doubled (I put mine in a warm oven for 1 hour). Then roll out on floured board to 34 X 21 inches in size. Once dough is rolled out, spread with butter, then applesauce. Combine cinnamon and sugar then sprinkle over applesauce. Roll dough starting at longest side (facing you) and carefully roll up (they may be messy!). Cut that log into half so you have two. Stretch them both little to make longer and cut each log into 12 even pieces so you'll end up with 24 rolls. Place 6 rolls cut side up in each greased 8" round pan. Cover and let rise 20 minutes until risen a little more (should be close to the top of the pan). Bake for 25 minutes in a 350' oven until golden. Frost warm rolls with cream cheese frosting (combine butter and cream cheese and mix well, then add vanilla and sugar and mix again, then add milk for desired consistency and cinnamon). These sandwiches were fun, and actually pretty good, a nice change from using jam. The kids seemed to like them and thought it was silly to use applesauce. *Use desired amounts for per sandwich. I wrote this review for "Mommy? I'm Hungry!" about Musselman's Apple Sauce. I received free product to keep for this review. All opinions for this review are that of myself & family. That bunny looks adorable and those rolls look pretty darned good to me too! I've never even thought to make an apple-cinnamon version of cinnamon rolls with applesauce. Brilliant!